Do you want to share with other people your passion for reading? Would you like to participate in the education, success and emancipation of others? The Association L.I.R.E. works with children and young persons in primary and middle schools in order to promote reading in every form and to equip children with the tools that will be useful for them in schooling and life in general. You will spend a time full of experiences, discoveries, sharing and service to society. Cooking within the hosting family. If you like reading and you want to share that habit that you have acquired, you are the volunteer we are looking for. Your general knowledge of libraries, books and texts in general, and a good ability to transmit all that are appreciable qualifications to help us with our activities. What the association needs is on the one hand your good will and helping hands to support our activities and, on the other hand, the know-how and habits that you bring along: the habit of reading, visiting libraries, a passion for novels or the ability for finding information in encyclopedias – it is all these kinds of general competences that the association seeks to transmit. You will also need the capacity to adapt, a sense of cultural respect, intercultural communication, patience, and mindfulness when it comes to interacting with others. It is in the face of all these individual and collective differences that we can succeed in sharing what we care about. You will participate in all the activities with the youths: reading clubs, mobile library in the village schools, and possibly other kinds of activities that you organize. Suggestions are more than welcome! So far we have had: a classroom journal, theater and writing workshops, a video project etc. Reading club at the RADI library. But you will also be a useful help in the tasks that come up everyday: repairing books, managing the mobile library (loans, readers’ cards etc. ), or possibly planning of a project for a new activity or meeting the local authorities for the organization of an event. Finally, depending on your competences and your motivation, as well as on the local circumstances, you can offer specific workshops to the association’s other voluntary members, that will help them improve their activities: workshops concerning extra-curricular activities or informatics (text processing, managing the website etc.). All that depends on your personal profile and needs. Everybody should be able to transmit her or his own know-how. Keep in mind that due to infrastructure and accessibility, the learning opportunities are often less easily accessible in Kpalimé than in a European city. Your pedagogic efforts and the time that you bring along will be even more appreciated. 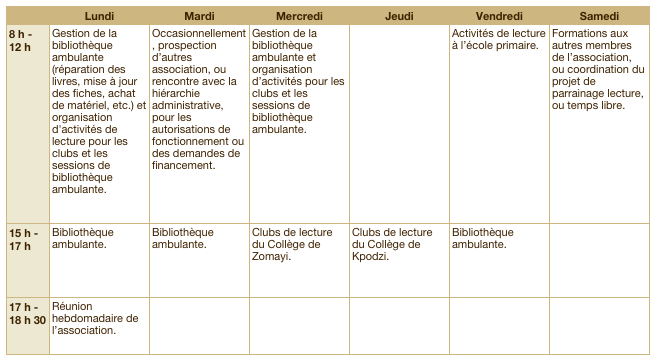 Here is an exemplary timetable (in French) for a volunteer of the association. It is not a rigid contract that you engage in; it only serves to give you a more concrete idea of what will be your tasks. In reality, it needs a certain flexibility that will enable you to easily take half a day or a day off for personal activities or to modify your tasks in order to focus on a new intiative. There is no fixed amount of weekly working hours that need to be fulfilled. You are a volunteer, you are free in your choices and commitments. 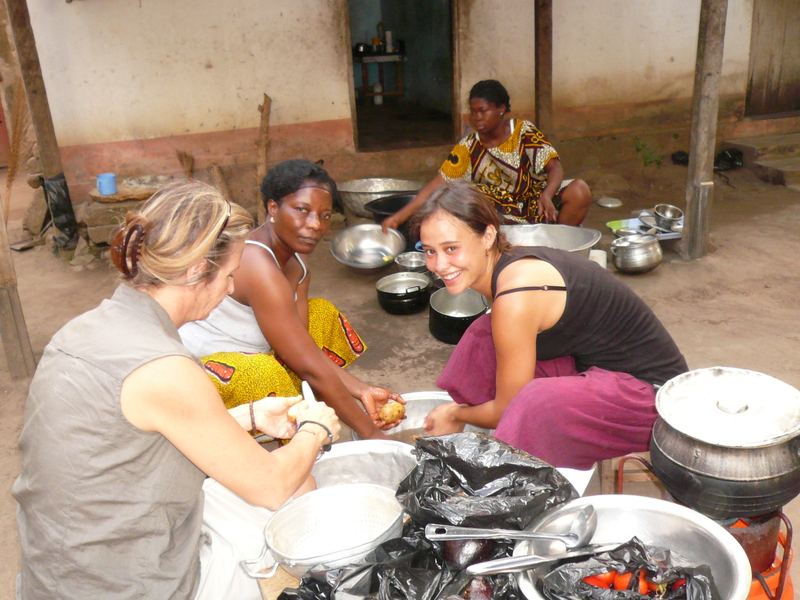 During your stay, you will live with a Togolese family. The chosen families will be those of the active members of the association and they will be happy to receive you, not only because you came in order to help and work, but also because they would like to make you discover their culture and way of life. If you are participant of an official volunteer programme of which L.I.R.E. is the partner (like ASA in Germany), this programme will also provide the financial support. If you have been recruited by L.I.R.E. for a specific mission/project, for a certain time and based on specific competences (with a formal selection interview), the association will cover your living expenses on site, or even help you cover the costs of transport – depending on what you have been told. If you contact us on an individual basis, for a voluntary participation in the association’s general activities, we can also support you in the realisation of that project and we would be happy to exchange with you. In this case, the association asks for a participation of 110 € per month in order to finance your stay (subsistence fees that will be handed to the families, costs included in your reception at the airport upon your arrival etc.). Our contact persons in France can accompany you in your search for financial facilities – but be aware that we cannot give any guarantee in this regard; in order to have the best chances possible, we suggest that you deal with it as early as possible.